Leverkusen have a way of staying competitive consistently throughout the season only to fall short once the run in comes around. Once again they find themselves near the top of the table and deservedly so. Leverkusen have been hovering near the top for most of the Hinrunde and have been the most consistent team in the league next to Dortmund. Since losing to Gladbach on Matchday 2, Leverkusen lost only once in 15 matches. Leverkusen have the second most amount of draws in the league though and have found it rather difficult to attain maximum points at home. In fact, Leverkusen’s home form has been their biggest deficiency so far. It is rare for a team’s away record to be better than their home form but Leverkusen have not lost on the road this season, winning 6 and drawing 2. On the other hand, they have only won at home 3 times and against opposition they would normally expect to beat and their only two losses this season came playing in front of the home crowd. One of the Bundesliga's breakout stars, Sidney Sam, celebrates after scoring against Hamburg. Most have overlooked Leverkusen because of Mainz and Dortmund’s impressive performances but Heynckes and company have performed consistently and boast the second best attack in the league after the league leaders. They have a potent offense with Kiessling, Helmes, Sam, Barnettta, Augusto and Derdiyok. At different points in the season Heynckes had to contend with injuries to the aforementioned players, meaning he had to alternate formations and systems to accommodate what remained. Heynckes eventually settled on a 4-2-3-1 despite favoring a two-striker formation. The return of Kiessling from injury should make things interesting in the Rückrunde though. Best performer: Sidney Sam. Although Arturo Vidal can make a strong claim to this distinction Sam has been, next to Kagawa, the breakout star of the season. Sam impressed in Kaiserslautern’s push for promotion last season but few expected him to make the transition from second division football so effectively. Sam’s readiness to take players on and inventiveness from the wings have been a big reason for Leverkusen’s strong first half performance this season. 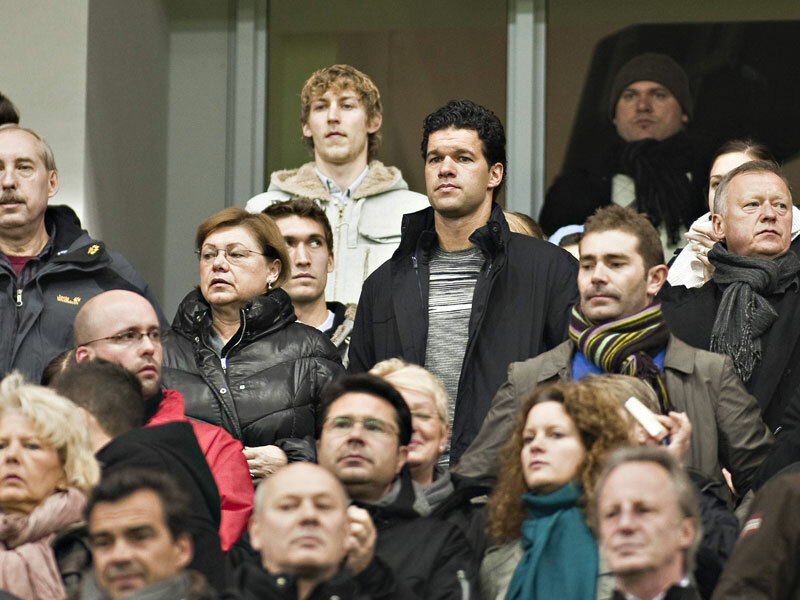 An injured Ballack looks on from the stands. Biggest disappointment: Michael Ballack. Not due to performance but due to his lengthy absence. Ballack is still nurturing an extension of the injury he received in last season’s FA Cup final with Chelsea, an injury that ruled him out of the World Cup and subsequently the rest of the calendar year. His transfer back to Leverkusen recalled that of the prodigal son, the last time Leverkusen made a splash in German football and on the European stage. Ballack’s experience and leadership is meant to resemble a final piece of the puzzle to a team that has become notorious for always being on the brink of achievement but continuously failing to take that final step. Question – Can Leverkusen shake their reputation as underachievers? Their notorious reputation for chocking when it counts will once again be their biggest hurdle when the season resumes next month. Jupp Heynckes is the most experienced coach in the league though and the return of Ballack should instill the necessary stability for Leverkusen to continue their consistent level of performance. They will need certain players to continue playing well however and others to step up their game. Vidal for one has been immense, winning the most duels in the league (156 out of 279) but players like Barnetta and Derdiyok has been rather inconsistent. Most importantly, Leverkusen will need to improve their home form. If they do that, they will have the tools in place to banish this adage. Speaking of Cinderella stories, Hannover’s story is quite remarkable. A little over a year ago they were mourning the loss of goalkeeper and club icon Robert Enke, a loss that demoralized the team to an almost inevitable relegation. Their Houdini like escape from the drop was not enough to inspire any kind of confidence going into the new season and as spirited as their supporters are few would have expected the kind of performances we have seen from them so far. Instead of playing into the hands of pundit predictions Hannover find themselves not only in the top half of the table, but on course for a European spot. Mirko Slomka has done everything right since taking over in January. 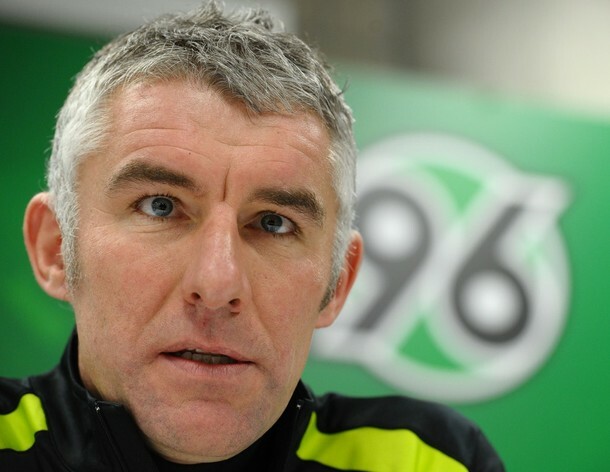 Mirko Slomka has seemingly changed the team’s mentality completely and no team embodies the idea of incremental progression as much as Hannover. Since taking over in January, Slomka has gradually improved every single player on the team and found ways to utilize players that were written off long ago. Players like Austrian defender Emanuel Pogatetz, labeled “mad dog” for his brute style of play in England, has been a surprise rock in defense and Sergio Pinto, formally a squad player, has become Hannover’s midfield general. Slomka also got the best out of Hannover’s youth, helping the 20-year-old Konstantin Rausch establish himself as a first team player and one of the most potent wingers in the league while continuing to develop 22 year old Manuel Schmiedebach into one of the best performing central midfielders of the Hinrunde. One of the Bundesliga's hottest strikers, Ya Konan with a double against Stuttgart. Best performer: Didier Ya Konan. As mentioned, Hannover did not get where they are so far without a collective performance but one player separated himself from the rest. 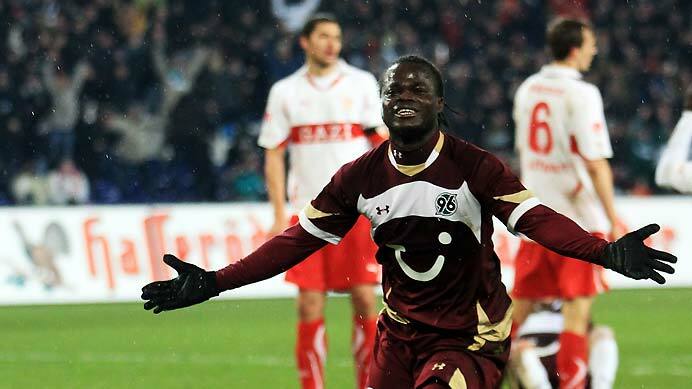 The Ivorian striker is already touted as Hannover’s best ever signing. Signed last year from Rosenborg for a little over half a million Euros, Ya Konan has more than repaid the team that brought him to Germany. Ya Konan scored 9 goals in 16 matches so far, as many as he scored all of last year. Hannover lost only once when Ya Konan scored, a reminder of how important he has become to Slomka’s team. Biggest disappointment: Considering Hannover’s expectations at the beginning of the season and their place halfway through it, it is difficult to draw up anything remotely disappointing. Hannover do need to shore up their defense though. Shockingly, despite being 4th, they have a negative goal differential and tend to leak goals away from home. Question – Are Hannover a one hit wonder? Hannover have won as many games so far as they did all of last season, a very convincing improvement and testament to the work they have put in. Momentum seems on their side and team spirit is at an all time high in recent memory but the winter break could undo all that. Countless times in the past a team had impressive Hinrunder performances only to have their momentum interrupted by the long winter break. The break is shorter than usual this year though and what would be a more fitting tribute to the memory of Robert Enke than a spot in Europe?